The RX-8 possesses the immensely publicized RENESIS engine (13B-MSP), but some say its true characteristic lies in the handling of the machine. Being the 4 door succor of the RX-7 model, the RX-8 is known to be one of the best handling machine produced after light modification of the suspension. We bring the country's RX-8 that is tuned with the best suspension to Tsukuba Circuit for a thorough examination! I have driven the RX-8 on many occasions on the street and track, and I feel as though it is one of the best handling cars out there. People say that the machine lacks power compared to the RX-7 but that's only during straight line acceleration. This machine holds one of the greatest cornering capabilities. We tested the RE Amemiya RX-8 with a GPS data logger and found out that the vehicle's speed during cornering were superbly fast. Basically, the machine is able to maintain a high speed while turning because of its capability of entering the turn very sharply. The RX-8 prospers at the tighter turns than the high speed corners. Since the sharp turning abilities, the machine handles great all the way from the entry to the apex. This machine is the best for such courses as the Tsukuba and other windy race tracks. Honestly, I have never enjoyed a better handling car other than the FD3S and the S2000. But the earlier model S2000 is a bit sensitive while driving so it may be more difficult to control. The car attempts to spin out unless you carefully control the vehicle at the entry and the exit of the turn. On the other hand, the RX-8 has a stable feeling all throughout the corner; depending on the type of suspension tuning is performed. These cornering capabilities are not possible with cars such as a Silvia because of the front strut configuration. Increasing tire grip, modifying the suspension or downforce will slightly help, but in the end understeer cannot be completely eliminated. The vehicle should be well balanced throughout, and a front double wishbone (rear multi-link) will provide the best results in this case. The characteristic differs from that of the quick 4wd vehicles of today. Those cars dive go into the turns at great speed and upon slowing down, it relies on its power and traction to exit the turn successfully. The RX-8 clearly holds a faster turning speed. Don't get me wrong, the RX-8 is very fast at high speed corners as well, and with 100 more horsepower, it can be classified as a top level contender. But with 220 horses, no weight reduction, and equipped with high grip radial tires, it amazingly clocks in at 1 minute 6 second mark at Tsukuba. The machine proves that power is not everything and turning is an important factor too. This is quite a high performance machine. "A machine that improves your techniques!" "It doesn't rely on the power but on the turning. This machine trains your driving technique." Although it lacks the power of a turbocharged vehicle, the turning characteristic is the one of the best. It will not lose to the top notch vehicles out on the track. 1 min 6 sec. with Light Mods! 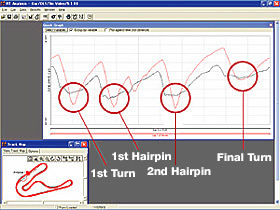 A GPS data logger was used to measure the RX-8's quickness. Although it's not the fastest, the best time that was produced was 1 minute 6.66 seconds. Considering only that the vehicle's suspension was lightly modified, no weight modifications were performed, and a set of used radial tires were mounted, it's time is more than agreeable. A stock Z33 usually tends to clock in at 1 minute 10 second range. On the rear straightway, turbocharged 2 liter machines pull around 180 km/h, while our RX-8 was rated at 153 km/h. This is a perfect example of its great cornering capabilities. According to the graph, the RX-8's turning speed is 20 km/h faster than the Lancer Evolution. The results speak for themselves. The RX-8 is proven to be a demon at the turns. A Comfortable Circuit Machine Built for Endurance! We have seen RE Amemiya tune its machines with such components as bolt-on turbochargers and even NOS kits, but this RX-8 remains naturally aspirated. This vehicle was not built as RE Amemiya's demo car, but as a private daily driven machine for one of their customers. A ram air intake along with an RE Amemiya Super Intake Box was installed, and a stainless steel exhaust manifold was bolted to the dolphin tail titanium muffler. The fuel and ignition is controlled by the RE Amemiya Redom Mini unit for a total output of 220 horses. The Quantum RE Amemiya spec suspension sports Swift springs (F: 14kg R: 10kg) and is targeted not for the race tracks, but for daily driving. The original aero parts make the vehicle very stable even at high speeds. In addition to these modifications, AP racing brakes were added along with an aluminum radiator and ducts that guide hot air out of the engine bay. The machine was made with reliability through many laps on the circuit instead of just speed. "The machine firmly grips the road and provides great stability!" The stability produced by the combination of the Quantum based suspension and the aerodynamic body parts are evident in this machine. The efficient dampers work well against any road surface and once the vehicle goes into the turn, the suspension takes care o the rest. With these great features, a beginner to intermediate racer can safely hit the race tracks. Although the set of tires were a used RE-01R set, it matched very well with the rest of the machine and clocked in at the 1 minute 6 second mark. With the use of new tires, I may have taken the time even further. It could have used a more quicker reacting setup for the Tsukuba circuit though. I prefer a setup that can make the car move more aggressively at the entry of a low speed turn. The vehicle needs a little but of balancing (tuning wise) by changing the dampening force or the sway bar strength. I have no problems with the engine since it feels very much like a rotary motor, spinning freely to the higher RPM levels. It's amazing how good this machine performs with just simple modifications such as suspension and intake/exhaust. RE Amemiya had succeeded in completing a top notch vehicle. The AD Facer 8, side skirts, and the rear under spoiler are all RE Amemiya's original aero kit. The GT3 rear wing provides excellent downforce and stability while turning. Totally tuned from intake/ exhaust to aerodynamics! Bucket seats were installed to firmly support the driver. Regardless of its heavy weight, the machine lapped in at 1 minute 6 second mark. RE-01R tires (245/40-18)were strapped on. Takeyari claims that the tires are a perfect match with the vehicle. 225 series could have also been used. 220 horses are produced from intake/exhaust + ECU tuning. The torque keeps up all the way to the higher RPMs for a smooth feel. RE Amemiya Quantum spec suspension were used along with a shop original Super Racing LSD. These components provide a reliable and easy to ride feel. Sets the potential of the machine free! Auto Exe's concept of tuning is to "bring the machine closer to a pure sports car". Although the RX-8 already is presented on the market with a high potential, Auto Exe attempts to take it even further than that level. The intake/exhaust, suspension, brakes, chassis reinforcement components were installed in this machine. The vehicle was targeted to be used on the streets with its bolt on components, and these parts can be installed anywhere with ease. In other words, anyone can build an RX-8 that can perform the way Auto Exe's does. On this SE-02S, an air ram intake and a titanium plus muffler were installed. The naturally aspirated engine smoothly picks up power to the high RPM range. Other components were installed include a newly developed suspension kit, big brakes, strut bars, and a sports clutch. The best feature among these parts is the adjustable sports suspension system. How will the painstakingly developed suspension perform on a race track? The tires used were still the ones used on the streets. "With higher capacity tires, my impression should greatly change!" Auto Exe focused on developing carbon fiber parts for the SE-02S for a sporty look. It brings out the sharpness of the RX-8. The settings are easy to adjust thus making driving the windy roads a blast. Regarding its performance on a race track, I would prefer the vehicle to have more stability in the rear. This is one of the problems with the RX-8, when the suspension is modified, the rear capacity becomes more higher than the front. Trying to balance the front and rear is a tough task. The suspension can be modified to withstand full braking at high speed as well. But over doing that will result in decreased turning capabilities of the RX-8. When oversteering at a tight turn, its usually easy to change its vehicle position, but in this case at a race track, the vehicle position changes too much. At the circuit, this vehicle holds the upper hand at the windy section. That is what Auto Exe was aiming for. It was unfortunate that the tires that were used today were not very high grip and not brand new as well. By changing the tires, the lap time could have been closer to a little above the 1 minute mark. Lastly, this naturally aspirated engine gives great feel at the mid RPM range. The carbon fiber components; front lip, side skirts, rear fender, and the rear wing are all coated with a special gel so it requires no painting. The rear wing is fully adjustable for the needed downforce. Every part can be purchased by any consumer! The carbon fiber air intake box can be connected to the intake duct for more air. A gain of 5 more horsepower and 3.5 ft/lbs more torque. The strut bar was designed to clear the hood. The silencer and the tip are made of titanium, and the rest is stainless. With the use of titanium, it is 30% lighter than the standard aftermarket exhausts. The center pipe consists of separated chambers that muffle the noise and increasing the flow at the same time. The sports tunable suspension has 12 different settings. A 40mm piston valve was used to minimize friction, combined with a front 11kg/mm and rear 4 kg/mm springs. The Gram Lights 57S-PRO (8.5J) was combined with a set of Michelin Pilot Sports tires. (225/45-18) These tires may not been sufficient enough for the race track. "These parts were developed for those who felt that a stock RX-8 wasn't enough and a race car setup was way too much. We provide a comfortable level of tuning." The RX-8's potential can be realized at the NR-A race! JAF organization holds the NR-A category races which street driven vehicles with valid license plates can only enter. The vehicles can compete in an equal environment in these races. In order to enter, the vehicle must be equipped with parts that were assigned from Mazdaspeed. This RX-8 was outfitted with a roll cage that complies to the Mazdaspeed regulations. The roll cages are permitted since they promote the safety of the driver. The basic regulations are that the air filters must only be a drop in type, the muffler and the suspension must be an approved model. The only tires that are approved must be 225/45-18 in size and be the Bridgestone racing tires. Even with these strict guidelines, the best time produced at the NR-A class races is 1 minute 7.371 seconds! This time is equivalent to the ranks of a turbo charged Silvia running the race course. This record time proves the high potential of the RTX-8 considering its modifications. "The stability of this vehicle should be copied by all"
It's very difficult to produce a good time in these NR-A class races. The suspension used on this machine qualifies as an authorized component to the regulations. The soft ride is very comfortable however, the vehicle must be driven carefully and smoothly in order to get a good lap time. I think that raising the spring rates will make driving the circuit much easier. There are lots of single model maker only races out there, but its great to be able to race in one of these without having to fork out lots of cash for modifications. When it comes to our level of tuning, these cars may be a little insufficient, but it's great that a roll cage and radiator + oil cooler upgrades are promoted in this class. The exterior of the vehicle is fitted with optional manufacturer components and others that comply with the regulations. These parts include a Mazdaspeed front nose, side skirts, rear under spoiler, rear wing, and aero mirrors. The air filter, spark plugs, and the spark plug wires can be any manufacturer, but the muffler and the radiator must be of an approved unit. An authorized oil cooler must be installed. The springs and the shocks are in stock configuration. The adjustable suspension units are not recommended for this race. Potenza 225/45-18 tires were fitted all around. The wheels are regulated to 8.5J in width, but the offset can be set freely. The best thing to do is to pick the lightest wheel out there. A 6 point roll cage is used. Anything over 4 points requires a harness. Any seat can be installed as long as it passes the government laws. A new color that gives a sport impact! There are 4 different models available for the RX-8 but the special vehicle presented today is the Type S model (6MT) and Type E (4AT). By using these models as a base, this new color scheme is made available. The 6MT version is overall the same in terms of performance but has leather interior and a 8 way adjustable front seat. The 4AT model has the same big brakes and the sports suspension as the Type S. There are other special additions such as a semi-gloss metallic lamp bezel that can be installed. This is the ultimate RX-8 to own!